The blaze started north of Las Virgenes Road, spreading east towards Cheseboro Canyon and south, through Liberty Canyon and the NPS-managed sites at Peter Strauss Ranch and Paramount Ranch. Earlier tonight, I returned home work to learn that the fire jumped a planned firebreak and spread west towards Boney Mountain (its north-facing massif pictured below), becoming its own, smaller blaze, the Hill Fire. The picture that precedes the opening paragraph is of Western Town, a façade of “Old West” buildings that was used in TV shows such as “Dr. Quinn, Medicine Woman” (CBS, 1993-98) and in movies dating as far back to “Cimarron,” one of the first Best Picture Oscar winners (1931). 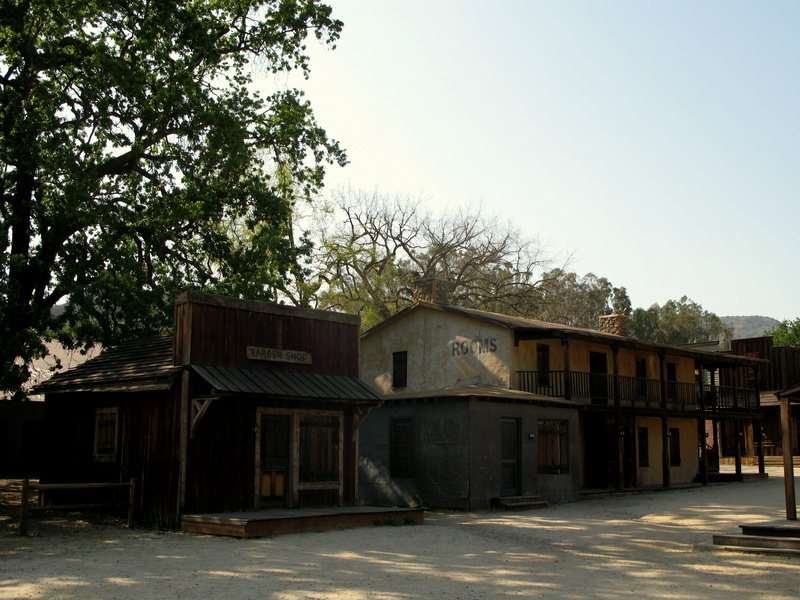 Western Town, near Agoura Hills, was owned by Paramount Pictures, who later deeded the acreage to the National Park Service provided that they keep the name Paramount Ranch. 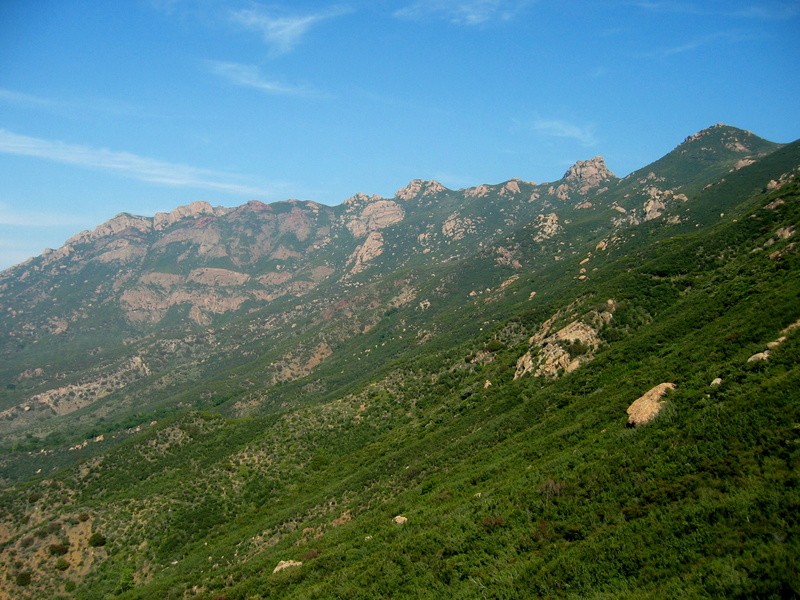 A pleasant network of trails depart from Western Town, and comprised one of the best places for “novice” SoCal hikers to break in their boots. I sometimes took out-of-town visitors to Paramount Ranch for a picnic lunch. Western Town is gone, obliterated by the Woolsey Fire. 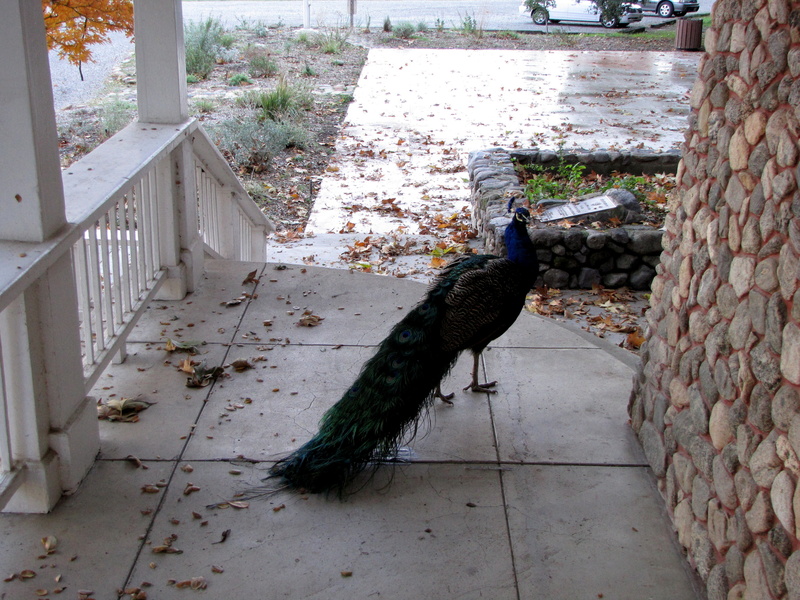 The picture below is of the ranch house porch at nearby Peter Strauss Ranch, a vast estate donated by the actor to the Park Service. Trails here wind up a forested hillside, and other points of interest include the largest swimming pool in Los Angeles County, and Buddy, the site’s resident peacock and photo bomber in the image below. 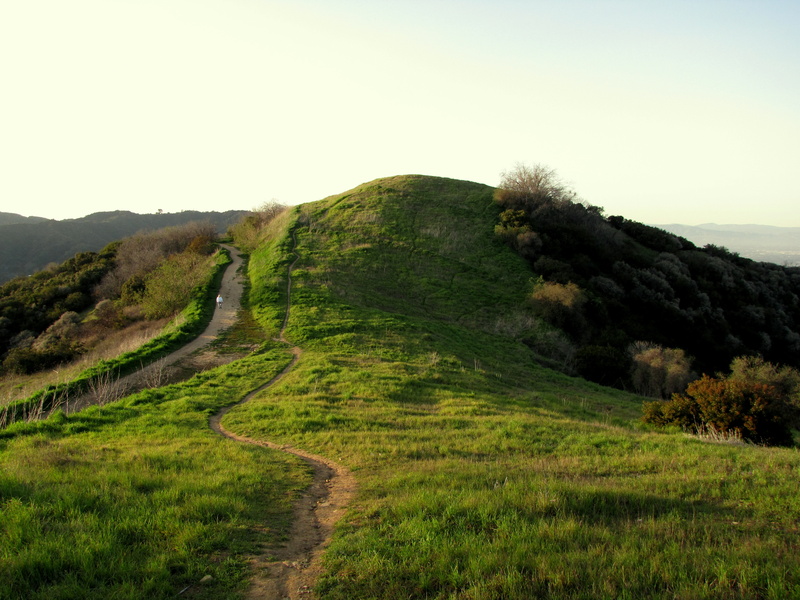 I remember hiking the trails of Peter Strauss Ranch one spring afternoon near dusk while parrots – yes, parrots! – sang from the palm trees overhead. Peter Strauss Ranch is gone – Woolsey Fire once again. 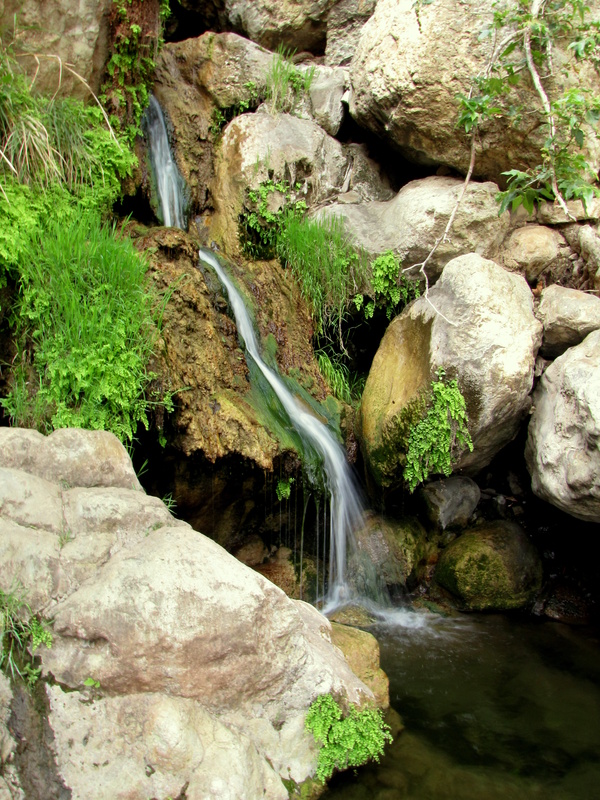 Also gone: the cabin ruins at the bottom of lovely Solstice Canyon (its waterfall pictured below), and the grove of old growth coast live oaks along the nearby Sara Wan Trail, which backs up against the Pacific Coast Highway. Also gone: the coastal homes of actors and celebs including Gerard Butler and Neil Young. Actor Liam Hemsworth posted a photo on social media of his home, burnt to the ground. Suffice to say, the photo went viral. Hemsworth, girlfriend Miley Cyrus, Butler, and Young join 20,000 other Malibu residents who were evacuated and escaped with their lives. Some were not so lucky. Two SoCal residents are confirmed to have been perished, and over 96,000 acres have burned. According to the Hollywood Reporter, firefighters (perhaps the most vital – and most thankless – job in California) have contained 35% of the fire, an increase from just one day prior. Still…they have their work cut out for them for the foreseeable future. In Northern California, things are even worse. At press time, 48 Butte County residents have perished and 130,000 acres have burned in the Camp Fire blazes, which began along rural Camp Creek Road and, courtesy of high winds and extreme drought conditions, is on track to become the most destructive wildfire in California history. I cannot imagine the horror as evacuees suffocated in their cars during traffic jams on packed routes leading to safety. Chico, the county seat and biggest California city north of Sacramento, is threatened, and the air is surely noxious. Unlike the Santa Monica Mountains, which I know like the back of my hand (or at least did prior to the Springs and Woolsey Fires), I haven’t done any hiking in Butte County, and don’t have any personal connection. But these fires are damnable, and as destructive as the insensitive words tweeted by President Trump on the subject last week. Below are links to various sites dedicated at least in part to California wildfire relief. I won’t speculate on what percentage of each dollar donated goes directly to the firefighters on the front lines or to the families whose homes were destroyed. Fundraising is complicated. Do some research and help if you can. Be safe out there, Californians. My heart goes out to you.